That's a great photo, i love these plants ! Motinot, before seeing them pictured on here i'd not really bothered with them but since .... i've put them on my 'wants list' !!! Have to agree with the girls, its a beautifull plant. I've lost mine, sadly. I still have a different species of Tricyrtis, though without any spots! One to grow in a pot??? They can be quite tall, Linda - and prefer shade, as well. I wouldn't try a pot, it would need support in one, for sure. This would look good in our jungle next year. 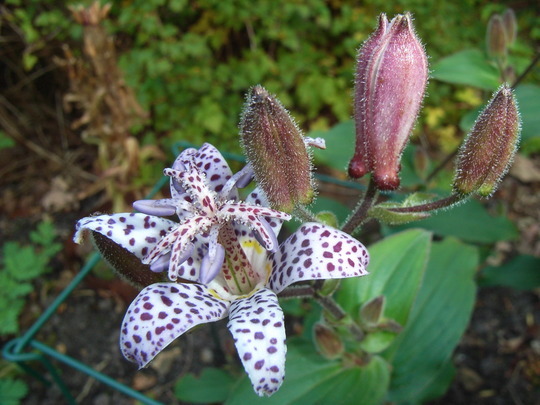 I have a Tricytis Miyazaki (Toad Lily) grows well in the shade and I'm about to order some more. Have you tried to propagate these. I wonder if you can you use layering and division to make new plants. Funny I should see this picture just when I was thinking about how to get more of these. Love this I have just bought it and also a Formosana Dark Beauty, can't wait for it to Flower! See who else is growing Tricyrtis hirta. See who else has plants in genus Tricyrtis.